I guess you’ll be surprised to know that all you need to start trading is 5K pesos only. The good thing is, stocks trading is done online where you can do buy and sell just like a normal online shopping website. All you need is a computer with internet connection and voila! You can start trading stocks. 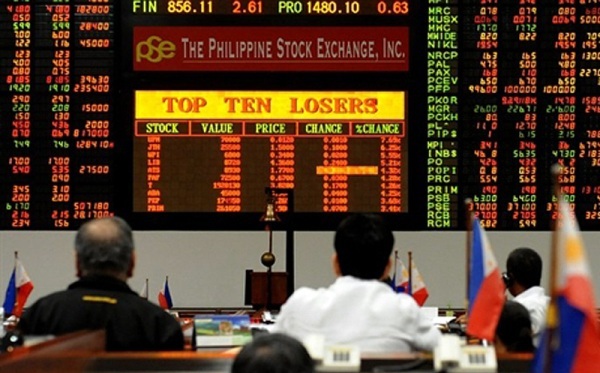 CITISEC ONLINE is Philippine based stocks broker and currently the best choice if you are working abroad. Starting capital to open an account is 5K pesos only. 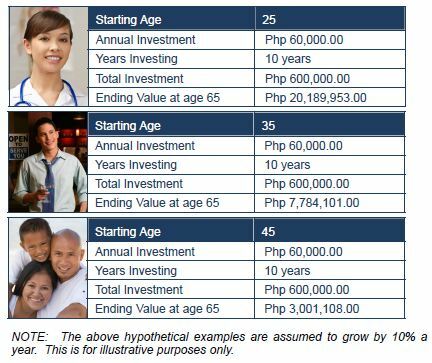 They have a program called COL EIP (Easy Investment Program) which gives investors a simple and more convenient way of investing in the stock market regardless of age, income or experience using cost averaging. Investing in stocks on long term basis provides higher returns of your money and sure way to guard it against inflation than any other investment instruments available. It outperforms savings account, time deposits, bonds and even government securities. There are 2 types of investor in terms of stocks. First is the trader, where almost 97% of them lose money. This is perhaps the origin of the saying “stocks is risky”. As an OFW, this is not adviseable. Full time traders with lots of knowledge in the stock market are losing money, why would you risk doing so? The high return of investment may be tempting, but better play safe with your hard earned money. Second type is the long term investor. Famous example is Warren Buffet. On average, if you keep your money on BLUE CHIP/GOOD stocks for 10 years, there is a 100% probability that you will earn from it. The key is investing in good stocks. Before you dive in stocks investing, it is necessary to study the market first. Know all the big companies that you think will be worth investing. You can ask yourself, which companies do you think will still be there in 10 to 20 years time? Do not invest in companies that may go bankrupt or those with no growth pattern in future. Look for a mentor to guide you along the way. I highly suggest that you look for a mentor to guide you along the way. You can subscribe to Bro. 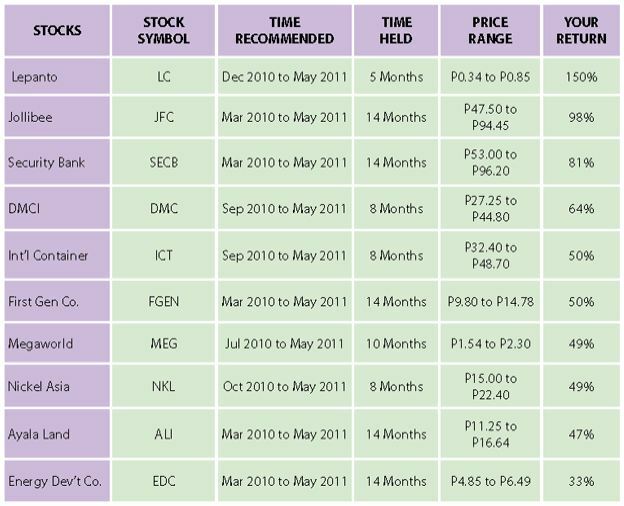 Bo Sanchez stocks update to guide you through the best way to invest in stocks. He even has a book that shows how he taught his maids to invest in stocks, and they are still doing it. If his maids can do it, why can’t you? Click here to visit and join the Truly Rich Club. On his weekly stocks updates, he will recommend which stocks to buy, which stocks to sell and will also give you information that may affect your stocks. For a newbie like me, this is a big help. How much can you earn in stocks? Stocks earnings are not guaranteed, as the market may go up and down. The higher the market will go up, the higher your return is. But if you will do long term investment, these up and down are just purely noise. Everyday, prices may go up and down but at the end of the year, good company will still make profit out of it. For example, if you will follow Bro Bo Sanchez advice on stocks, you would have earned below returns. Can you earn that growth % in the bank? Yes there is a risk, that is why you need to learn and look for someone to assist you along the way. It will only be risky if you will invest directly without knowing anything about it. If you want to learn more about investing stocks in the Philippines, visit Citisec Online website. Start by registering an account in Citisec. Here’s the step by step guide. please teach me how money earn in this kind of business….tnx i have only 5k extra money. hi rosalino, thanks for reading this article. however, this is not a business…it’s investment in which, you have to save regularly for the future. while 5K is a good start, you have to save and add more in future. 5K will become 1 million probably in more than 100 years. imagine if the yearly growth of your money is at the rate of 20%, and you need 1 million pesos per year to sustain your daily needs. how much total capital investment do you need? that’s 5 million pesos. i never expect you to have 5 million, but if you save regularly let’s say 5K per month, it will become 5 million in less than 15 yrs (approx). you have to understand this first before investing in stocks. it won’t grow overnight. Hi! I’m really interested in saving money. I’m married but doesn’t have a kid yet. Me and my spouse is both working abroad. We’re planning to invest in a mutual fund. Any advice? Thanks in advance. hi jao. yes, mutual fund is a good investment as well. may i know saang country kayo ngayon? i can recommend you a good mutual fund to invest to. Iv been thinking it for over a year and still cant decide whether to invest in mutual fund or not in IMG.. Im afraid to risk my money.. Please advice..
hi honey. in IMG, you have to choose which mutual fund to invest. You can choose between FAMI and PHILEQUITY, they both have good returns during this past years. investing in mutual fund is long term. if you can do that, invest in mutual fund. around 5 years or more will be great. however, if you cannot do that and you want your money back right away, this may not be good to you. Please teach me, I want to invest on this stock? hi aldwin, have you read this post http://richardmacalintal.com/my-wife-invest-in-stocks/ ? also, you can join in our facebook page, hit LIKE at http://www.facebook.com/richardlmacalintal as i’m giving useful information. My COL account was already funded and activated. MY TRC account also activated. But as you know, i am a newbie == no experience at all on stocks. How would I start? I don’t even understand the tables being given by TRC. Can i open a COL account even im outside the Phils? and how? im an OFW… Thank you.